I haven't quite finished two of my major projects of the recent past: "cooked legumes in cookies" and "coconuts". 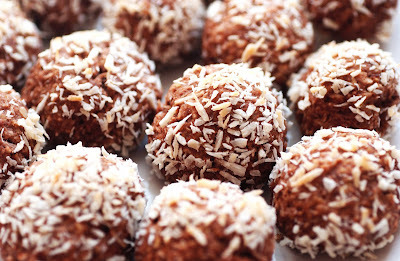 Here is my latest creation: cocoa coconut balls !! I first tried a recipe without beans, and found the cookies could have been a little denser. I remembered the texture of the Aniseed Sesame Cookies and my Coconut Kiss Cookies and wished those cocoa ones would have had the same. At the same time, I added some more natural sweetener to it as the first batch definitely lacked some sweetness. Now here we go: Cocoa Coconut Balls with white beans and dates. If someone had told me 2 years ago that I would bake some thing like this and even create the recipe myself, I would have declared them crazy. Preheat oven to 180 degrees Celsius. Line a baking sheet with parchment paper. Pulse the beans, oil, agave syrup, milk, chopped dates and vanilla extract in the food processor to a smooth and creamy paste. In a mixing bowl mix the wheat flour, with the coconut powder, baking powder, baking soda and salt. Combine wet ingredients with the dry ingredients. If the dough is to dry, add a little more milk. Make little balls out of the dough (approx. size of a walnut). Put some desiccated coconut in a bowl and roll the ball in it to coat them. Place them on the baking sheet. Leave some space between the cookies on the baking sheet. They spread a little while baking. Put the sheet in the upper third of the oven. Bake for about 15 minutes.